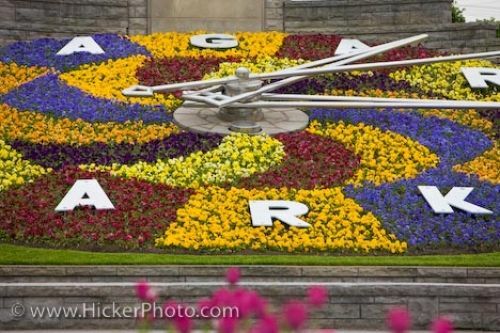 As the massive hands on the Niagara Parks Floral Clock in Queenston, Ontario keep the precise time, the gardens come to life as the blossoming flowers explode in a variety of colors during the spring. Horticulturists have spent many hours creating the exact blend of flowers and colors to ensure the lettering and clock hands prominently stand out against the blossoming garden. The Niagara Parks Floral Clock lures in many visitors especially during the spring and summer when the gardens are stunning. There are over 16,000 plants which have been bedded around the floral clock with the display changing a couple of times a year, all which is protected by a ten foot wide water display. The minute hand on the clock reaches 17.5 feet in length, the second hand being 21 feet long and the hour hand being the shortest at 14.5 feet long. Chimes ring from behind the floral clock every quarter hour and the garden sends off a beautiful aroma when the gardens are in full bloom. Picture of the colors of the blossoming flowers surrounding the Niagara Parks Floral Clock in Queenston, Ontario in Canada. The Niagara Parks Floral Clock along the Niagara River Parkway, near Niagara Falls, Queenston, Ontario, Canada.